Although today most parents would find the book disturbing, most parents in 1845 loved the book and found it incredibly funny. 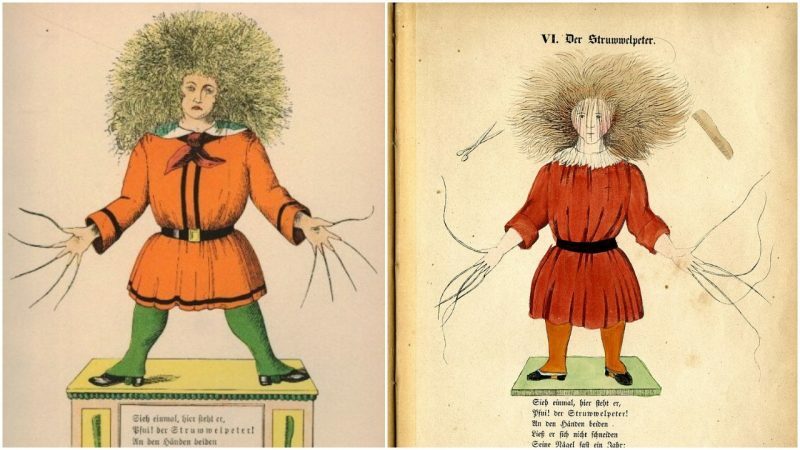 Der Struwwelpeter contains ten very short but merciless stories. Unlike any other bedtime story, in these ones, little children are severely punished for bizarre mistakes and misbehaving. 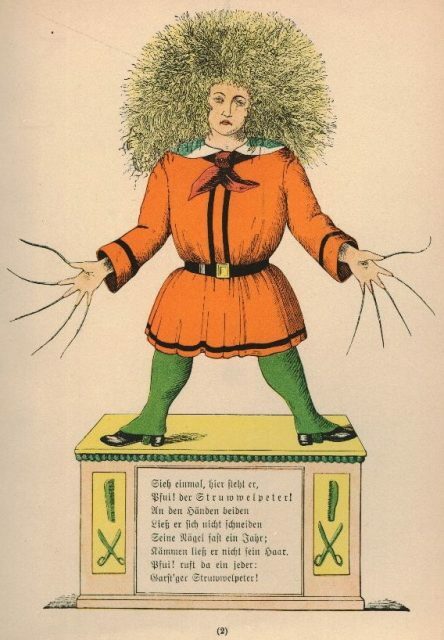 Der Struwwelpeter in a 1917 edition. “O take the nasty soup away! Unfortunately, even though Augustus eats all other meals, he gets very ill from not eating soup and dies after five days. And Conrad cries out Oh! Oh! Oh! 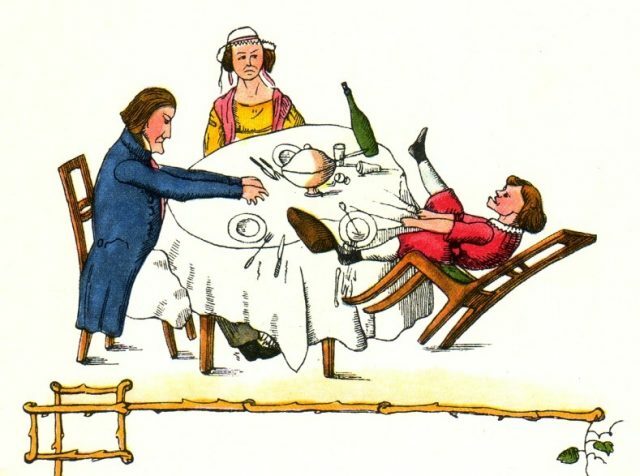 Struwwelpeter from 1845 (First Edition). With this story, Hoffmann introduced the bogeyman character of the Scissormann (or the Tailor) that appeared in European folklore. 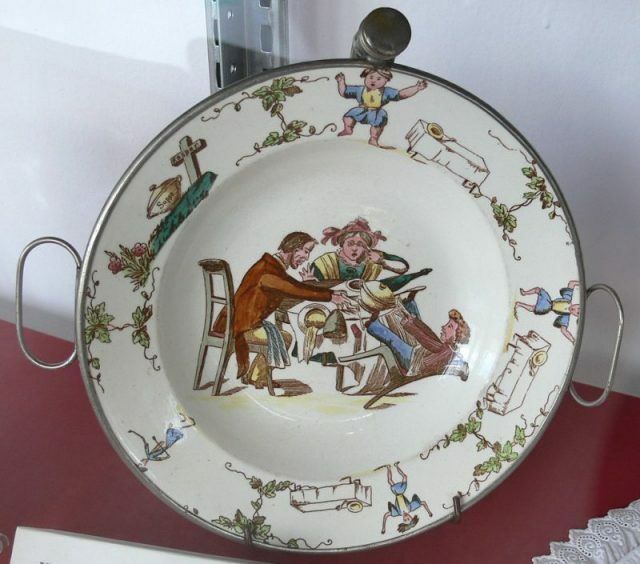 The “horrid wicked boy” Frederick, the antagonist in Cruel Frederick who kills bugs, tortures animals and disturbs people, is put through a less permanent, although arguably more deserving, physical punishment. 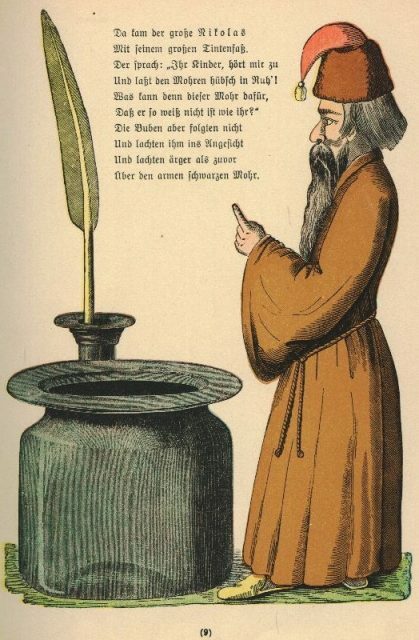 Nikolas, as he is about to dunk three boys in his inkstand. Illustration from a 1917 edition. And eats the pies and puddings up. 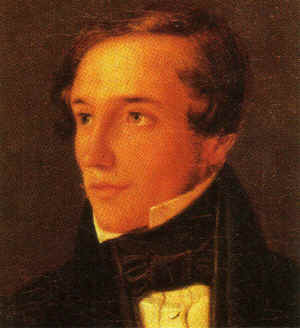 Zappel-Philipp. Illustration from the 1845 edition. Originally, Hoffman wrote the stories as a Christmas present for his three-old son. Later he read them to his younger patients and his book club friends who encouraged Hoffman to release his stories to the wider public and helped him publish the book. 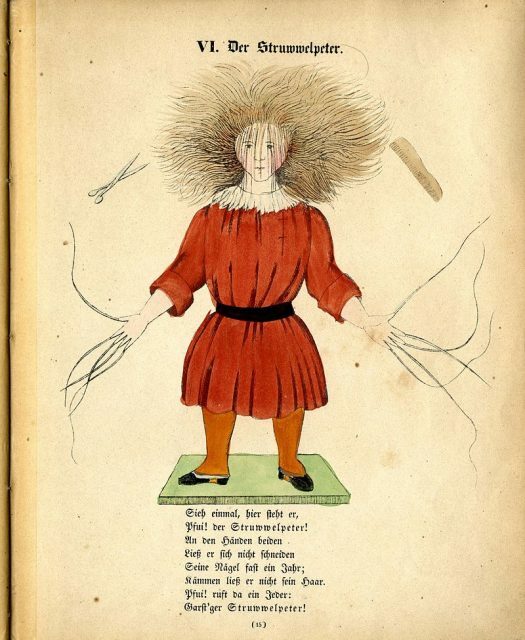 He called it Der Struwwelpeter, after the antagonist in one of the stories. At least 1,500 copies were printed, possibly as many as 3,000, as reported in a letter Hoffman sent to a friend. The book sold out in less than two years and the second edition was released with revisions made to the original drawings. 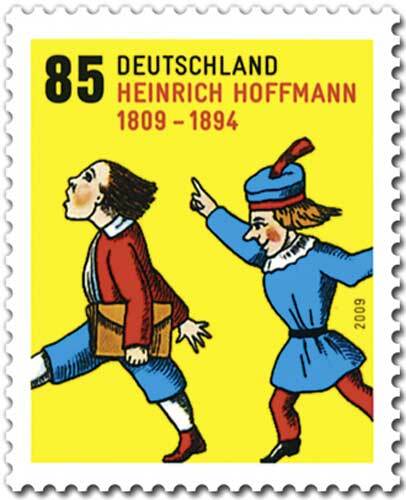 Stamp with two characters, issued on Hoffmann’s 200th birthday. One of the book’s biggest fans was Mark Twain who was the first to translate it into English in 1891. Unfortunately, due to copyright issues, Twain’s translation Slovenly Peter was not published until 1935, after his death. With its 15 pages, Hoffman’s book is a well-acknowledged masterpiece, not only for the stories but also for Hoffman’s illustrations in it, which are now considered a precursor to comic books. Also, researchers recognize many childhood mental disorders in the book that are known today. Some of the stories have been set on the movie screen, and some adapted for theatre plays. 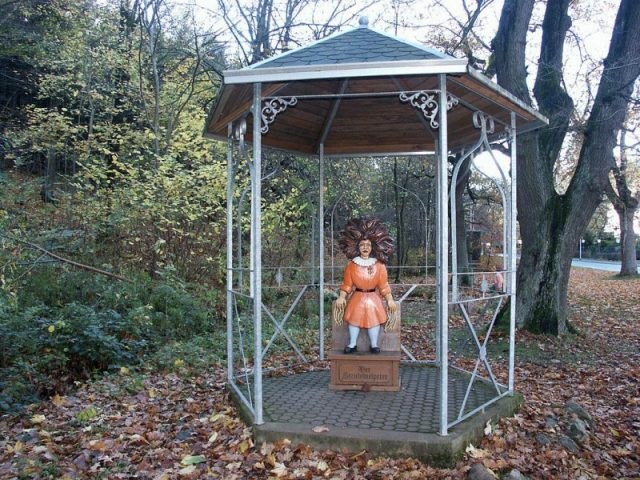 Famous authors such as Astrid Lindgren and Agatha Christie referred to Hoffmann’s stories and characters. The book is still a great read regardless of how young or how old one is. The fascination with it is guaranteed.